In the Age of Chaos two factions battled for dominance. The Kingdom of Azeroth was a prosperous one. The humans who dwelled there turned the land into a paradise. The Knights of Stormwind and the Clerics of Northshire Abbey roamed far and wide, serving the King's people with honor and justice. The well trained armies of the King maintained a lasting peace for many generations. No one knew where these creatures came from, and none were prepared for the terror that they spawned. Their warriors wielded axe and spear with deadly proficiency, while others rode dark wolves as black as the moonless night. Unimagined were the destructive powers of their evil magiks, derived from the fires of the underworld. With an ingenious arsenal of weaponry and powerful magic, these two forces collide in a contest of cunning, intellect and brute strength. With the victor claiming dominance over the whole of Azeroth. The Warcraft series is still going strong after almost a decade. 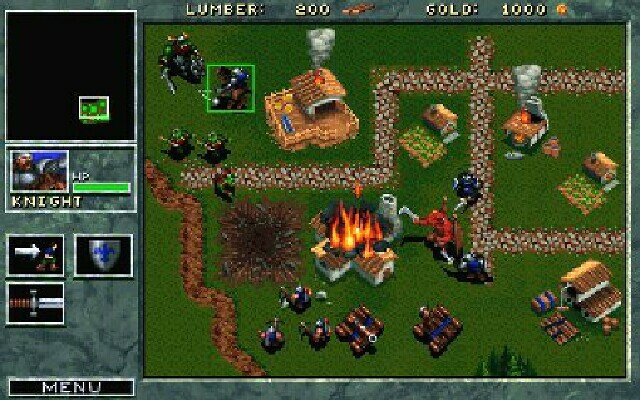 Like Command & Conquer, Warcraft helped forming one of the largest fan groups in the strategy genre. With its unique and exciting gameplay Warcraft showed how a fresh spin on an established premise could be wildly successful. 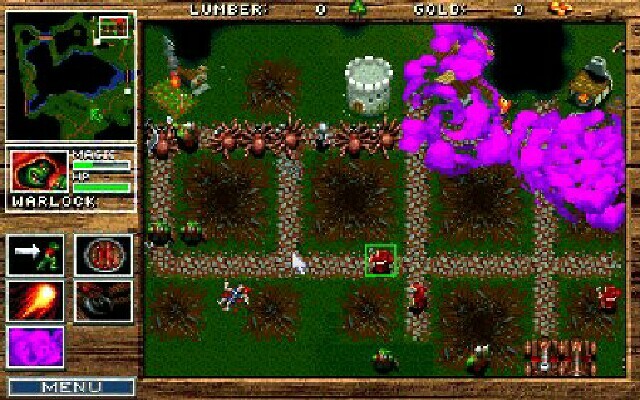 Even today Warcraft I is one of the most addictive RTS games ever. 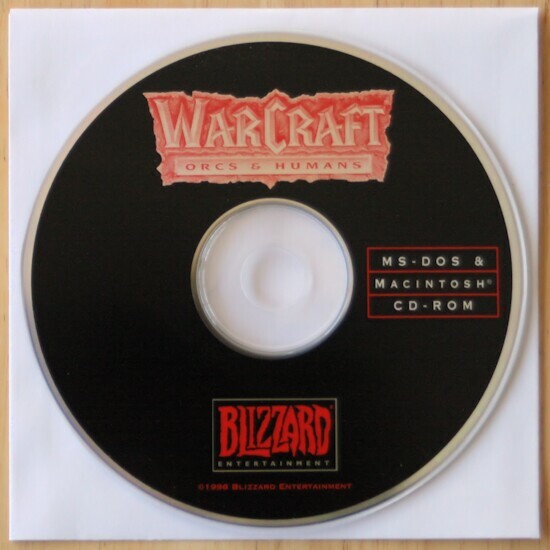 Anyone who isn't frustrated by the final assault on Stormwind Keep is either immune to emotion altogether or has melted theCD into a puddle of plastic after failing the scenario. The distinction with Warcraft is the player goes back for more. This wonderful game of tactics thrives on a simple interface and real-time play. While the pace is fast, it's not impossible, and players will focus on managing just two resources -- lumber and gold -- rather than dealing with the minutia many war games force into the forefront. This lumber and gold produces buildings and these buildings, in turn, produce various kinds of troops. The game is fantastically accessible and easy to learn but, as will become readily apparent to anyone who plays through the first few scenarios, will present puzzles and frustrations worthy of the most adept gamers. The Orcs, as the heavies, have compelling personality and will attract players, though the humans are slightly easier to play overall. Their archers have a bit more range and their magic is more useful than that which the Orcs possess. However, since the scenario paths of both campaigns are quite similar, you may wish to play the two games simultaneously by alternating between the two as you advance. For after having triumphed over one campaign, the other will be much simpler given your now extensive experience at Warcraft. One of the first important lessons Warcraft teaches is one of delicate balance. The desire to delve into the pursuit of expanding one's town, a la Sim city, may lead a player to churning out dozens of Peons. Their broken bodies make a nice garnish for the burned out shells of your perhaps quite impressive spread of buildings. An easy mistake of logic advocates that a Peon will pay for itself in four trips to a gold mine, so why not crank out as many as possible? The missing element here is time. You won't have much of it. When the game starts, you will discover a simple user interface. The first mission will be to establish a village with at least six farms and to protect it against the eventual raids of your enemies. In order to bring to term the construction of your farm, will you require lumber and gold as well as peasants. At the time of construction for any type of building, the quantity of lumber and gold required is shown on the screen and if you do not possess enough resources, a message will be indicated. Before long, you will not have enough lumber available and you will have to find more. A peasant can be sent out as a scout in search for a forest to find lumber. All things considered, the risk of being attacked by one of your enemies is great, so it is preferable to send a soldier to be the scout. Once you have a forest landmark, send your peasant in order to restore your lumber stock. Soon gold supplies will be lacking and you will have to search for a gold mine. As a general rule, one is situated in proximity to your village providing the recovery of gold. However, this one will be quickly exhausted by your needs for gold and you will have to go out again in search for another even more abundant mine. As in the beginning, you only have one peasant, and it is advantageous to have many. It's in the Town Hall that you will be able to train new peasants for your village and this will cost you 400 gold pieces per man. As the number of peasants increases, you will have to establish new farms to ensure that there is enough food. As for the soldiers, they are trained in barracks. The simplest soldier is the footman, but if you have constructed a lumber mill, archers will also be available. As you advance in the game and the scenarios, other units will be put to your disposition like knights, catapults, cleric and conjurers. Between themselves, clerics can: Heal the wounded, throw holy lances, render themselves invisible, and even have a complete view of the region (during a limited time). Even more powerful, the conjurers have powers to: strike an enemy from a great distance with the elemental blast, summon scorpions, summon elemental of water or of fire, and cast rain of fire, a very devastating spell. Your armies will benefit from material upgrades with the lumber mills to reinforce the strength of arrows, and with the blacksmiths to increase the grade and quality of the steel used in the weapons and armors. Each upgrade will cost you large quantities of gold. During battles, you will encounter many types of monsters like the ogres, scorpions, spiders, brigands, slime, skeleton, demons, and even elementals (that might escape your control). As all players soon discover, the computer is aggressive. Before you're ready you'll have Raiders coming to visit and bashing all the Peasants you just spent so much money creating. If you, in turn, create Footmen or Knights and send them out to ward against these intrusions, you'll simply play a game of exchanging dead for dead. You need to set up a strong defense to give your Peasants time to prepare your resources for war. Warcraft follows a simple principle: strength lies in numbers. A simple defense involves winning in math. If you have more troops than your enemy, typically you'll win a fight. Start by building a wall of Footmen. Four Footmen can make short work of a Raider. Then you'll discover that your enemy has a few more tricks. Footmen alone, actually, make a poor defense. They're too weak and you'll lose too many as your opponent sends wave after wave of assaults. The best way to keep your wall of Footmen alive is to kill enemy troops before they get anywhere near your wall. That's where Romans come in. The phalanx revolutionized warfare in the first century and Warcraft begs to repeat this lesson in history. Line your wall of Footmen with Archers behind it. Eight Archers will shred a Raider before it can swing its sword even once. If you position your phalanx strategically on the entrance to a bridge or between a break in trees, you'll force your enemy into this gauntlet every time it wants to attack. Building this solid defense determines which buildings you should concentrate on in the early stages of your game. If you don't have one, spend your initial purse of gold on a barracks. Then, after you've enough gold coming in (via Peasants) build a lumber mill. This will allow you to train Archers. Later in the game, spend your gold on upgrading your Spear or Arrow technology far before you bother with Ax, Sword, and Shield strengths. If you've strong Archers in place, you won't need better swords. Once you've defended well, you're almost ready to get offensive. But not quite yet. Don't jump the gun. It's easy in Warcraft to forget how strong your enemy is and to underestimate how many troops it will take to level his, her, or its town. The computer tends to hold back, waiting to throw the bulk of its forces against you when you're foolish enough to get near its town. For that reason, stay away. It's better to explore the map with the help of your Far Seeing spells rather than unwittingly unleashing a juggernaut. But if you leave your enemy completely undisturbed, you'll likely find yourself facing an extraordinarily strong opponent in the end game. You need to keep your opponent guessing and under attack without sparking an all-out confrontation. There are a number of different ways to harass your enemy. Sending a Raider or two up into the ranks of its Peasants is an easy way to knock off a few enemy troops. Diversions work best with this strategy. send one Raider up near the enemy town and, once it has captured the attention of the enemy troops in the area, lead them off and away from the town. Now send two or three Raiders up (with perhaps a Spearman or two) to kill off as many Peasants as possible. Maybe you'll get lucky and wipe out a catapult while you're still alive. Timing, rather than resources, is the key to Warcraft. When your harassment forces penetrate deep into enemy territory, the time may be ripe for your final assault. Build troops for your attack. You'll need a few more Knights than your defensive walls required and you'll want to have at least four Wizards fully rested. As you launch your offensive, have your Wizards cast their major summoning spells. Four Water Elementals will do wonders for an attack. Be sure to move catapults forward to make quick work of your opponent's town. Be sure to target its barracks before going after farms. If you find stiff resistance to your final assault, you may have jumped the gun. Retreat. Don't just sacrifice your army because it's fun to watch. Try to turn a losing battle into a chance to trap and spear to death your enemies. But, if you've played your game well, this final stage will be as simple as moving all your troops into your enemy's town and watching them slaughter the remaining hapless souls left. All of the above adds up to, believe it or not, only the barest of strategies for the game. Warcraft is tightly balanced so there is no simple yet infallible solution. If you are fan of the Warcraft series you should play the first chapter end to end. You will realize that Blizzard got it right the first time. This is a title that many other games have tried to emulate and many more that were directly influenced. The Warcraft series remains strong to this day and with such a solid foundation it is easy to see why.